Jurgen Klopp’s anger from Liverpool’s draw at West Brom was nowhere to be seen after Stoke City played out a stalemate at Anfield. Liverpool manager Jurgen Klopp pictured on Saturday. JURGEN KLOPP HAILED a ‘really important point’ after a goalless draw at home to Stoke City moved Liverpool a step closer to securing a top-four finish in the Premier League. Mohamed Salah should have given the Reds an early lead against their relegation haunted opponents, while Stoke defender Erik Pieters was fortunate to escape punishment for handball in the penalty area as the clock ticked down. 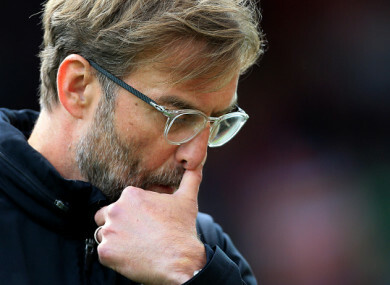 However, very much at odds with his irritable reaction to last weekend’s 2-2 draw at West Brom, Klopp took a pragmatic view of the performance and refused to chastise the officials for Pieters’ late let-off. “I take the point,” Klopp told Sky Sports. “It’s one more than before the game. It could have been worse, that’s for sure. “With a little bit more luck… the situation around the handball to me looked like a penalty but we didn’t get it. “In the Champions League [quarter-finals] we were one or two times a little bit unlucky against [Manchester] City with rough situations. In the Premier League not one time, to be honest. “Now we have to carry on. It’s a really important point for us. We need another three and have the opportunity to take them in two more games. Tottenham are four points behind Liverpool in the final Champions League qualification spot, while Chelsea’s slender hopes of gatecrashing the top four rely on beating Klopp’s men at Stamford Bridge next weekend and enjoying an unblemished run-in. Next up for Liverpool is Wednesday’s trip to Roma, where a 5-2 advantage makes them heavy favourites to book their place in the Champions League final. Captain Jordan Henderson took a blow to the foot against Stoke before going on to complete 90 minutes, while a dead leg sustained by Trent Alexander-Arnold is not thought to be serious. “We are not in the most comfortable situation, squad wise,” Klopp added. “Andy Robertson couldn’t train the past few days. We tested before the game and he was ready for the bench. Email “'It could have been worse' - Klopp accepts Stoke draw despite penalty controversy”. Feedback on “'It could have been worse' - Klopp accepts Stoke draw despite penalty controversy”.